It seems a well-sourced NFL typist can foresee a new second-string signal-caller for the Bucs this season. In a column about the movement of NFL quarterbacks this offseason, heavy metal-headbanging Jason La Canfora of CBS Sports is of the mind the Bucs will have a new backup for America’s Quarterback, Pro Bowler Jameis Winston, and his name is Joe Flacco. Thus, La Canfora believes, veteran backup Ryan Fitzpatrick has taken his last snap for the Bucs. Sign Joe Flacco. I don’t see there being much of a trade market here, unless Jacksonville picks Flacco over Nick Foles. But I would see Bruce Arians – who is trying to win rightbleepingnow – loving Flacco’s big arm and unflappable demeanor and wanting someone like that around Jameis Winston. He needs insurance should Winston slip up off the field again (he’s already been suspended) and they need the right kind of veteran around. Bringing Ryan Fitzpatrick back is not advisable, as some on the offense tended to gravitate to him and not Winston in the past, and it is time for a fresh start at the QB2 spot, needing someone else to really push the QB1. Joe isn’t sure about Flacco but Joe can easily see Fitzpatrick wearing another uniform this fall. Look, Bucco Bruce Arians already stated part of building Jameis’ confidence back up is believing in him. One way to do that is to jettison Fitzpatrick so Jameis isn’t looking over his shoulder, which he was probably doing last year. Jameis said he was trying to do too much when he returned to the lineup after serving his three-game sentence over his hassle with an Uber driver. Joe isn’t sold on Flacco being a backup. That dude looks like he is toast. He’s a far cry from the guy who guided the Crows to a Super Bowl win. Personally, Joe would probably rather have Ryan Griffin as a backup over Flacco. If Arians truly is the quarterback whisperer, he might make something out of Griffin. Hell, look what Arians did with Drew Stanton. I don’t see us investing that much into the QB position with so many holes and upgrades needed. With Winston getting a big raise we would be best off with a cheap vet or rookie developmental QB. If Jameis was looking over his shoulder at Fitz, bringing in a former Super Bowl winning QB (toast or not) probably wouldn’t be the best idea. Says something about Jameis’ maturity I know. I don’t see us investing that much into the QB position with so many holes and upgrades needed. You are onto something Snowman. I’m going to go Drew Stanton in a trade, swapping of 4th round picks with Cleveland with us moving down. The Browns sign either Fitz or Ryan Griffin to be their backup (Todd Monken is there now). Yes because after all who actually wants to be a starter in the nfl, why not shoot for the stars and backup an average quarterback when you have the super bowl ring. I’m sure Flacco knows there are a few other teams not sold on their quarterback like Jacksonville and Miami. Fans may not like it but BA has already put his faith in Winston it’s kinda dumb to cut one journeyman Flacco who lost his job to Tebow was its speed. To expensive for clipboard holding. BA has to put his money where his mouth is and ride with Winston or nothing he said since being hired means anything. Pretty sure Jameis would be more paranoid about Flacco on the bench then Fitzpatrick. That makes zero some sense. Jameis even admitted he was mental trying to be Fitzpatrick after those 1st 3 games last year. 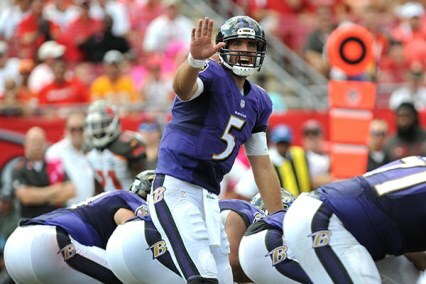 Did you see Flacco on the bench at the end of last year when Jackson was starting. He wasn’t happy. He wants to go to team to start. And if he doesn’t he wants to go to team with ability to take starters job. Plus he will make over 10 mil at least. Bucs cannot afford him. Bucs draft backup in 4,5 or 6 round this year. Bring back Josh McCown is the easy answer, if the Bucs can afford him. Great in the locker room, will want to help Winston succeed, and will not want to take his job. Plus, as a bonus, there is not better human being on the planet. Jameis is either our franchise QB or he’s not. This is his ‘Sink or Swim’ year. Fix the OLine. Fix the running game. Fix the defense. No more excuses (and ‘We don’t want Jameis looking over his shoulder’ is just another excuse IMO). Ryan Griffin would do just fine as our backup QB. And this ‘Oh but he’s never taken a snap in the NFL’ bullspit is just a diversion … we’re talking BACKUP for heaven’s sake. And Alaskan you’re spot on. We’ve got too many other NEEDS to put a whole bunch of money into BACKUP QB. IF we can fix most of those holes, and IF Jameis can stay healthy & have a great year, and IF this coaching staff can work their magic here, then MAYBE we can have a very good inaugural year for BA in Tampa. Lots of IF’s, BUT … every team has lots of IF’s this time of year. Would be nice if we hadn’t wasted 3 years of holding a roster spot for Griffin and never see him throw a pass in a real game…. Perhaps BA will like what he sees in Ryan Griffin – and give him a real chance to play if something were to happen to Jameis. Let Fitz go. Keep Griffin for cheap – draft a rookie in a later round to groom on the practice squad. We don’t need to be paying Flacco or any backup QB 5, 6 or $7M – “just in case”. I’ve got no problem signing a guy like Flacco as an insurance policy. This is “make it or break it” year for Winston! If he continues to struggle with turnovers on the field, or has any more lapses of character off the field, Flacco can be the bridge until we draft another QB. If however, Winston is able to keep his nose clean and develop beyond the mid level QB that he currently is, then Flacco is nothing more than a solid backup with starting experience…just in case of injury. You bring in Flacco, and VIOLA!!! QB controversy!! !….and appropriately so. What an insulting slam at Jason Licht……he keeps Ryan Griffin on the roster taking up a spot for three years and he never gets a snap & he’s not qualified to be Jameis’ backup…..unbelievable. We should not spend more than $2 on a backup. Keep griffin and draft qb in 4,5,6. The kid from Washington State or the kid from Oklahoma State etc etc could be better backup then griffin. Only in 4 if we are able to trade back and get extra picks in early rounds. Still like trading back a few spots (for team wanting qb at our spot) and taking devin white. We need a back up that can step up and finish the season. It will take 4-5 games for BA to see that Winston is not the man. We need a reliable back up to man the ship. First…La Can’t-fora being referred to as “well plugged in” is a stretch. He’s a guy one step above Slapaport, and occasionally relevant in the offseason, but he often justs mentions things, like this, took keep his name afloat, when things are slow, and forget anything breaking originating from him. Second, and of the most glaring omission here on Flacco, with the Dolphins, Bengals, Jaguars, Redskins, Giants…(and possibly Broncos and Raiders both via trade of theirs) ALL needing viable starting QB’s for 2019, Flacco’s agent isn’t going to allow Flacco to not fully explore all 5 viable starting gigs to its fullest, BEFORE ever even entertaining a back-up job anywhere. Then, even if a back-up role becomes a reality for Flacco, Joe wouldn’t end up where there’s a young one with no real chance of to replace that young starter going forward!! Then there’s Jameis looking over his shoulder again. La Can’t-for a is being a stooge here…nuh-uh. Movin’ on. BA has already made the commitment to JW. Flacco or any skilled and experienced backup QB would just be Fitzmagic 2 and if he looked better than JW in practice and preseason games…here we go again. I’m with everybody who put the kabosh on paying much money for a backup. Griffin should get his shot and as others have said draft a QB prospect in later rounds and see if he develops. Who knows maybe we could get Bill Belichek lucky and find a Tom Brady in the 6th round. If you think Jameis is looking over his shoulder now with Fitz wait till Flacco comes in and impresses during camp. If Jameis somehow gets off to a slow start don’t think for one moment BA and company wouldn’t like to kick the tires on Flacco again. Let Griffin be the backup. And the trying to do to much excuse has been going on for how many years now? How can anyone possibly ask for scrawny Griffin be the back up QB….? Dude, your rage over Jameis is scary man. He’s even got you doing double-talk. You are completely consumed and obsessed by Jameis. You have to be an Arizona Uber driver. Ease up for your own health man. It’s hard to see how a backup quarterback without an NFL snap would blow up the locker room — your words — yet a first round pick backing up Jameis wouldn’t blow up the locker room. Which is it? Either players are cool with a quarterback green as grass or they are not. If Griffin isn’t worth snot, then why in 7734 has Lichtweight had him carrying his hanky around for 3 years. This does not even make any sense. Some players gravitated to Fitz (D-Jax), because at the time he was playing much better ball the Jameis. Players are going to gravitate towards a winner and a leader.